Today was a wonderfully sweet day. Finally got the boys out of the house and up to Hawk Mountain around 3pm. Such a wondrous ride through majestic Kempton. Then the slug up the mountain. Boys have an adventurous side that I am just not used to but Mom is trying her best to relax. If they want to peer out over the rocks my heart does not need to race!! My eldest said that if he dashed to pieces on the rocks and died just know that he died happy! Oy! Anyway on the way home we stopped by a lovely antique shop. I had been wanting to take the boys there and show them the way cool Katana that was for sale. It was an enjoyable stay in this nice shop. Just as we were exiting I noticed a Jade plant that had to be nearly 3ft tall. It was a beaut! The owner told me that his wife liked to give people a piece because it grew so rapidly. He promptly called his wife to the front. Lets just say I left the shop a very happy woman. 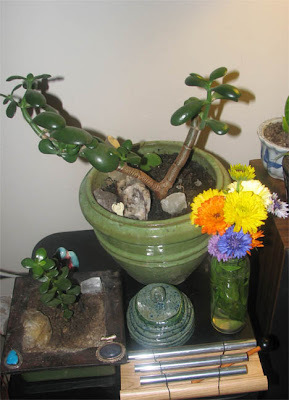 Below is the picture of my new Jade plant that was gifted to me today. When she handed the lush sprig to me I held it in my left hand and I could feel the energy pulsating through that branch. Amazing. In the photo below you will find a lovely ceramic pot that I purchased from Catalpa and you will see a wee little bright Jade oval peeking out of the soil. That wee piece of Jade was gifted to me by my beautiful friend Lala. You will also see in the square dish another Jade sprig that Lala gave me when I did a Reflexology session for her. To the right you will see a vase of the lovely flowers that are growing in my garden. Not to mention my crystals :-) A flat of white quartz crystal found in Bethlehem is propping up my Jade tree. Behind the tree is a tall Lemurian crystal and right next to it is a beautiful bright green Jade leaf. It is so beautiful when someone gives you a living gift! Thank you Janette!